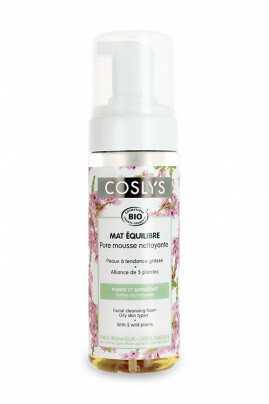 COSLYS Organic Cleansing Foam "Cosmousse" gently cleanses oily skins. It combines 5 vegetal actives to eliminate sebum excess and impurities. This natural face cleanser leaves your skin smooth and purified. Apply Organic Cosmousse Coslys on wet skin, massage gently and rinse with water. Follow by applying Coslys face cream for oily skin. Aqua (water), hamamelis virginiana flower water*, glycerin (vegetal glycerin), sodium coco-sulfate (anionic surfactant from coconut), cocamidopropyl betaine (amphoteric surfactant from coconut), decyl glucoside (non ionic surfactant from coconut and glucose), calluna vulgaris extract* (organic heather extract), fumaria officinalis flower/leaf/stem extract*, coco-glucoside (non ionic surfactant from coconut, palm kernel, sunflower oil and glucose), glyceryl oleate (non ionic surfactant from copra, sunflower oil, glucose and vegetal glycerin), alcohol** (vegetal alcohol), coconut alcohol, sodium sulfate (anionic surfactant from coconut), sodium chloride (salt), hedera helix extract* (organic ivy extract), salvia officinalis (sage) oil* (organic sage essential oil), commiphora myrrha oil (myrrh essential oil), tocopherol (natural vitamin E), glycine soja (non OGM soybean extract), citric acid (pH regulator), parfum (100% natural fragrance), dehydroacetic acid (conservative), potassium sorbate, sodium benzoate, benzyl alcohol (conservative), linalool (component naturally present in the fragrance).